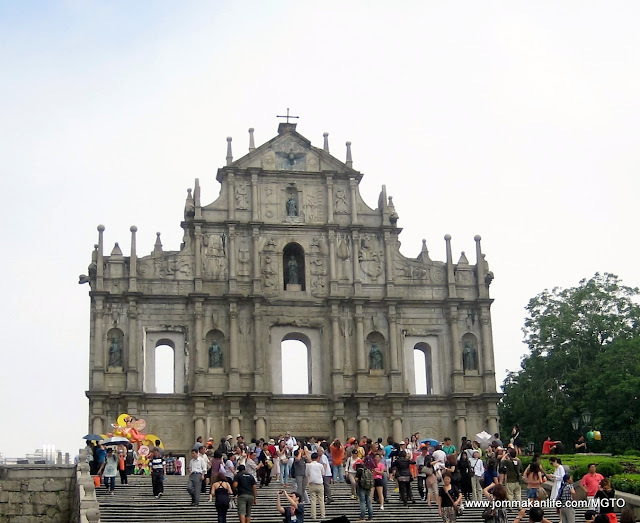 My first impression of Macao was its food which combines Chinese and Portuguese culinary influences, occasionally spiked with subtle European, African and Southeast Asian nuances - possibly resultant from the halycon days when Macao was a key port of call for foreign seafarers. Thanks to Macao Government Tourist Office (MGTO) in Malaysia, I was reacquainted with some popular Macanese specialities at a special luncheon, held in conjunction with the (MIGF) - Taste MIGF (Malaysia International Gourmet Festival) event. Macau Government Tourist Office Representative in Malaysia Ms Cherry Lee (right) welcomed guest chef Chan Yok Kong from Galaxy Macau during the event, hailing the chef's wealth of experience (over 20 years) and his efforts in promoting Macanese cuisine. Lunch commenced on a high note with Macanese Salted Codfish Balls (below pix, left) and Sauteed Clams with Coriander & Lemon. The deep-fried potato and bacalhau (Macanese dried salted cod) croquettes had a mellow brininess to them and tasted even more delectable when complemented by tomato and onion relish. Delicately sweet and tender, the plump clams left us 'shell-syiok'; their natural jus melding with the tangy lemon and fresh coriander accents harmoniously. The main course of African chicken (Galinha à Africana) was a notable show-stopper of grilled chicken smothered under a soulful blend of shallots, garlic, paprika, tomato and peanuts. We found its delicious flavours similar to that of our ayam masak merah. Warm Indian spice notes lent an aromatic slant to the Chickpea Cream Soup. A dollop of pureed vegetable rounded the velveteen broth with a discernibly fresh, clean edge. Completing our Macanese experience on that day was none of than Serradura (sawdust in Portuguese), the famed Macanese dessert whipped up using cream and digestive biscuit crumbs. Chef Chan's creation was the best I had savoured thus far as his inventive streak inspired him to use a combination of buttery and chocolatey crumbs layered alternately with lush cream. MGTO has also embarked on a slew of marketing activities, promoting the city's biggest upcoming events including the 63rd Macau Grand Prix (19-21 November) and enticing visitors of Taste MIGF with some of popular delicacies. One of the 'must eat' items in Macao you can't miss is Portuguese Egg Tarts. These irresistible pastry is markedly different from the Hong Kong/Cantonese ones as the buttery pastry is slightly thicker and filled with soft, delicately sweet egg custard albeit with caramelised top. Food gifts to buy should you visit Macao include the much sought-after Almond Cookies (top) and Ginger Candy (below). Most folks would have their faves so do some research before your trip to discover what suits your tastebuds.